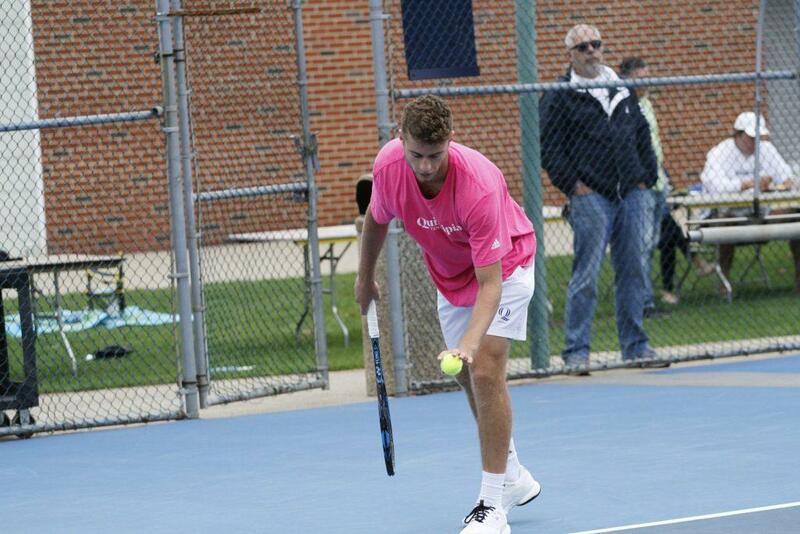 The Quinnipiac men’s tennis team (1-0, 1-0 Metro Atlantic Athletic Conference) went up against Rider University men’s tennis team (1-1, 0-1 Metro Atlantic Athletic Conference) on Saturday at the Quinnipiac courts. The Quinnipiac Bobcats beat the Rider Broncs in all matches, 7-0. The teams started off playing doubles. In the No. 1 doubles matchup, Aleska Martinovic and Axel Stern from Quinnipiac went up against Rider’s Lysander Payano and Peter Komosinski. Martinovic and Stern won their match 7-5. The No. 2 doubles matchup was Quinnipiac’s Freddie Zaretsky and Austin Yannone against Rider’s Javier Melendez and Ryan Ciaccio. Quinnipiac’s Zaretsky and Yannone won that match, 6-0. Already securing the doubles point, Quinnipiac’s doubles three team was Patrick Cachapero and Alester Magalit against Griffin Cuek and Nick Salazar. Quinnipiac won this match as well with a score 6-0. After the doubles, the singles matches were played. The first singles match was Quinnipiac’s Zaretsky against Rider’s Payano. Zaretsky handled Payano beating him in straight sets to get the second point for the Bobcats. The second singles match was Bobcat’s Martinovic against Rider’s Melendez. Matrinovic came out victorious 6-0, 6-3. The third match was Quinnipiac’s Cachapero against Rider’s Komosinski. This went three sets but Cachapero won the match with the third set finishing 7-5. This got Quinnipiac four points and gives the Bobcats the win on the day. However, the Bobcat’s were not done. The fourth singles match was between Quinnipiac’s Hielke Moore and Rider’s Griffin Clark. Moore put Clark away by winning the sets 6-0 and 6-1, respectively. The fifth match was between Yannone against Salazar. Yannone got the better hand of Salazar winning in straight sets. The sixth and final singles match was between Magalit and Ciaccio. Magalit put Ciaccio away as well. Quinnipiac won all their matches and in result won 7-0 against Rider on the day. Quinnipiac Men’s Tennis team will next play at the ITA regionals from Oct.11-Oct.14 at Princeton University.